Our schools, sadly, are structured by the extreme income inequality and lack of mobility that has increasingly characterized U.S. society since the late 1970s, a disparity more unequal in the U.S. than in other developed nations. Over the last fifty years, the country’s top 1% of earners have gained 275% greater income, while the middle spectrum of earners have gained less than 40% and the bottom five percent have stayed virtually stagnant. Tragically, instead of formal education now being the way to upward mobility that it once was, it now, if anything, perpetuates inequality. In 1945, a child had two more years of education than his or her parents. Now that figure is six months. Test scores, grades, drop-out rates, admission to college, and college success rates all correlate with income. Right now our educational reward system is an ecosystem where failure for those already deprived of resources is the almost inevitable outcome. Where a system of inequality is systematically rewarded, there is no true democracy. We are judging failing students and failing schools competitively against those whose resources have increased 275%. When we standardize educational consequences based on outputs but without comparable concern for the inputs, we are measuring income inequality not intelligence, skill, potential, creativity, independent thinking, innovation, or drive—the things we believe to be essential to a democracy. 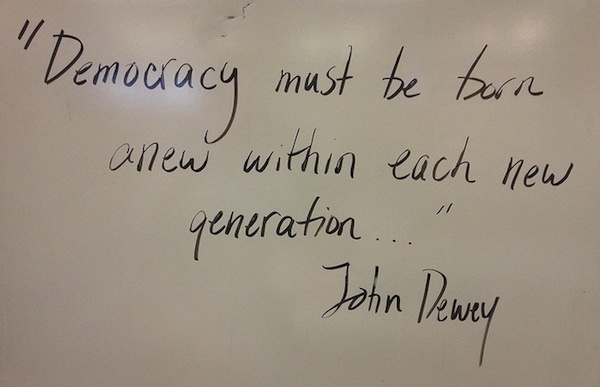 Our “democratic future” (the theme of our 2013 Digital Media and Learning Conference) requires a system redesign. Needless to say, renewed public support for all public education funded equally would be the single most significant way to reframe the educational context for meritocracy, not material inheritance. 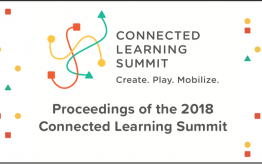 Since there are few signs that such a revolution is imminent, the connected learning agenda focuses on supporting learning in informal contexts to contribute to the success of kids. These are enhanced, alternative pathways to learning for all kids. For those youth who go to under-supported schools, connected learning contributes opportunities that overworked public school teachers simply do not have. (1) Social learning: Connected learning helps youth figure out the best ways to use their own talents to gain knowledge and to work with one another to achieve success. Peer teaching, peer leadership, and peer-to-peer feedback are part of the learning design. These collaborative, learning-by-doing skills are inherently valuable as life skills that help youth to survive and thrive in school and beyond. (2) Maker culture and media: It goes without saying that youth love media and that many schools are not able to provide computers and other devices to kids to help them master the technologies that shape our world. By focusing on youth’s ability to interact, connect, design, create, and program their own devices, connected learning becomes a foundation upon which other learning—and future careers—can be built. (3) Passion, interest, and play: The academic subjects on standardized testing simply do not excite every child. What does? Connected learning is rooted in the idea that everyone has something they want to learn about, and finding out what that is key to success in life. Not every child is interested in the same things but kids are inspired and do better when they are around other interested kids. They share an ecosystem where the joy and discipline of mastery are reinforced and encouraged. (4) Badges and new forms of assessment: If we lived in a utopian, egalitarian world where people seamlessly moved from their interests and skills to a workplace that perfectly matched and rewarded those interests and skills, we would not need quality metrics. We do not live in such a world. Instead, standardized testing is the single most consistent apparatus for gatekeeping the status quo, from preschool to professional school. Instead of blaming teachers for “failing schools,” we should be blaming our unequal society. As an alternative to fixed, standardized, summative grading of a few core academic subjects, we’ve spent the last twenty months exploring digital badges as an alternative system for identifying and validating skills, accomplishments, quality, and interests that can be earned in many learning environments. Open badging makes it easy for anyone to issue, earn, or display badges across the web through a shared infrastructure free and open to all. No fill in the blanks. No Kaplan cram schools. No teaching or learning to the test. Badging is a crucial element in framing a context in which a more democratic, egalitarian outcome is possible. 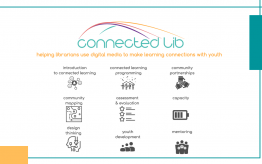 These are a few dimensions of the connected learning ecosystem designed to promote a more egalitarian and democratic society. There are literally dozens of other ways to create an ecosystem where learning flourishes for all. What are yours? I hope you’ll add them in the “Comments” below, and that your week at the “Democratic Futures” conference will be full of new ideas that will help you shape the context where all our best dreams can happen.